My wife and I stayed in unit 2104 for four nights im May. We had high hopes based on the reviews that we had read, but the unit, and especially the front lanai, exceeded our expectations. We were closer to the ocean than we had anticipated based on the photos, with only a short stretch of lawn between us and the crashing waves. We loved being on the second floor, as the view was great. The whole unit exuded luxury. And the oceanfront pool was one of our favorite places to relax. Welcoming tropical breezes, the sound of ocean waves, glorious sunsets over the ocean, and the fragrance of exotic blossoms await you at Kanaloa 2104. We loved staying in this condo. Quiet, peaceful tropical setting with calming surf seen and heard from the lanai/living/dining/kitchen areas. Very relaxing, like coming home, not a hotel room. One flight of stairs easy to navigate, (not steep, a turtle tile inlay welcomes you at top of landing! ) Plenty of space, especially the great room area. We are used to the desert so a couple nights felt too humid. We used both the overhead and pedestal fans in the bedroom at night after showering to cool down. It was part of our Hawaii experience! The bedroom is brighter than we are used to at night (even with all the blinds closed) Easily fixed by wearing a sleep mask. By morning you will wake with the birds anyway! Actually a good thing! Tub in master bath is VERY deep. Was tricky to navigate for a shorter person. Overall: So happy and relaxed here we didn't want to leave. For the two of us (could have four if use the sofa bed) It was just lovely. PS: Any questions and the owner is very helpful and sweet! We celebrated our 43rd wedding anniversary and brought our granddaughter with us. Lot's of room for us . We spent most of our time on the lanai taking in the view and the sounds of the waves. The chairs and umbrellas came in handy for our beach trips. This place has all the comforts of home and more. We would recommend it to anyone. This is our second stay at the Kanaloa Condos. The complex is beautiful, quiet and well maintained. There are three seperate pool/hot tub areas (including gas grills) to choose from and a path along the ocean to walk on(not paved.) It is a 5 minute walk to a little cove that you can snorkel in, a 5 minute drive to a grocery store, gas station and restaurants and about a 10 minute drive to Kahalu'u. Condo 2104 is well appointed and we didn't feel that anything was missing. The kitchen is nice (more lights over the cook top would be helpful but not necessary) and has an assortment of items that you would normally need such as tupperware, ziploc bags and spices. The Ginsu knives were sharp and much appreciated. The ocean view from the lanai is incredible and is a great place to have meals. We miss the sound of the waves crashing on shore already. This ocean view condo has set the bar high for any future vacations. There is also a lanai off the bedroom that has a nice view considering it also overlooks the parking area. There are ample ceiling fans and we never felt the need for AC. We left the windows and sliding doors open at night and were awakened every morning to a myriad of birds chirping. A few odds and ends left by other users are there: beach mats, collapsible coolers, etc. There are ample beach towels, washer and dryer, a coffee maker and a blender. There is a stereo system and two TVs that were somewhat small if you wanted to watch a movie (do that at home!) The king size bed and the furniture are comfortable and not worn. The bathrooms are nice, one with a large shower and the other with a jetted tub. The only things that may need addressing in the near future are the carpet (a little run down but we prefer tile or wood) and the refrigerator (freezer barely froze water). Overall we would recommend this condo and complex to anyone looking for a nice quiet reasonably priced place to stay. It is a solid choice and a good value and in a central location between the northern beaches, Captain Cook and Volcanos. We loved staying at Kona Bliss! We had breakfast on the lanai overlooking the waves each day and feel asleep to the sound of them rolling in each night. The condo was clean and comfy and had everything we needed from kitchen gear to beach gear. We wished the Oceanside Pool was open later, but we did go to one of the other pools in the evening. Location was perfect for us, out of the downtown area, but still easily accessible. Nice walking opportunities without driving. We enjoyed our stay at Kanaloa 2104. Very relaxing, quiet but loved bird sounds each morning and waves crashing. Nice ocean view from lanai. Enjoyed the ocean pool. The unit was very clean and well stocked kitchen equipment as well as beach chairs and portable coolers; even boogie boards. We would definitely come here again. Condo #2104 at Kanaloa was spotless, very well stocked with towels, sheets, kitchen items, beach toys/coolers/towels/chairs/paddle board, and had very comfortable beds and furniture. It has a lovely ocean view that we spent many hours enjoying from the lanai. Would certainly rent this condo again and highly recommend. Great condo. Great location. The condo was well stocked and clean. Coffee on the lanai in the morning was great way to start the day. We are planning to return next year. Friends chose the Kona coast for their destination wedding so I asked a girlfriend to come along with me as my "plus one" for the ceremony and we spent the rest of the time hanging by the pool, walking in the neighborhood, driving around the island and eating delicious food. Our condo was in a great location a bit off the routine traffic and yet close to everything we needed. Our unit was very comfortable with a big bedroom and a fold-out sofa bed in the living room. I gave my friend the bedroom and I chose the sofa bed which was very comfortable, so that I could leave the glass door to the lanai open and fall asleep listening to the waves down below. The whole Kanaloa at Kona area was well maintained and there was a security detail just to be sure we all felt safe. I found a couple of small issues in our condo, but they were addressed quickly after I reported them. All in all we had a wonderful trip! Staying in unit 2104 was a real pleasure. It was quiet, clean, very well furnished and equipped with good quality items. The resort itself was well laid out and offered many ammenities such as 3 pools amd tennis courts. A large, full service grocery store (KTA), restaurants, drug store etc are located nearby.Landcsaping on the resort site is attractive and well maintained and site security, including controlled (gated) access is operated on a 24/7 basis.Our only negative comment would be with respect to the lack of air conditioning in most of the units. However, this is common in condos in Hawaii and most (as was 2104) are equipped with good ceiling and floor fans.We would highly recommend Kanaloa at Kona and partuicularly unit #2104. This unit appears to have been recently updated as it was in perfect condition....marble counter tops in kitchen and both baths; comfortable furniture and new-ish flooring and fixtures. The view from the lanai was amazing as, during our entire stay, we enjoyed watching the swells crash into the lava rock sending spray high into the air. Mesmerizing. We had some extended breakfasts out there and also enjoyed evening wine and dinners on the lanai. The resort complex is conveniently located five minutes or less from the Keahou Shopping Center and maybe ten minutes to Kahaluu and 28 minutes following Ali'i drive over to two-steps for snorkeling.The lack of A/C was a bit of a distraction and would be the final component to rating this unit a ten on a scale of one to ten. We stayed in #2104 for ten days starting in late May 2017 and loved it. It is beautifully decorated and equipped with just about everything you will need. The property is lovely with a stunning ocean view and just a short walk to a nice little snorkeling beach. As mentioned, there is no A/C, but the evening ocean breeze and ceiling fans kept us comfortable at night. We will absolutely stay here again. We've been coming to Kanaloa at Kona for the past 32 years.Condo 2104 is one of the cleanest, well-stocked unit we have rented.The location is great! The unit is quiet and the view is beautiful.We definitely look forward to future stays and will recommend this unitto friends/family. The condo was very nice and well kept. There was a problem in the Master bath in that the stopper was stuck solid and the water drained very slowly. I called it in but no response while we were there. I did say it certainly was not an emergency. All in all a very nice place to stay. My wife and I spent two weeks at this condo in February 2017, It was comfortable, clean and quiet in the evenings. The condo has a great view of the ocean, and is the Keahou location is convenient to all the Big Island destinations we desire to visit. It was great to have a washer an dryer available as well as a high speed wifi connection. The apartment was recently renovated as has great appliances. Great condo with nice ocean view. We stayed at Kanaloa #2104 over the Christmas holiday and even though the island was packed, this complex was very quiet and an enjoyable place to stay. The complex is well tended and sits between the ocean and a golf course so the environment there is terrific. The condo has a nice design that separates the bedroom from the kitchen and lanai so it's good for for those who like to sleep in. The unit is very clean, updated, and well appointed so you have everything you need. We enjoyed the very large lanai with a great, private view of the ocean. Many thanks to the owner who was very helpful with advice and tips for our stay. Fabulous condo, location, and owner! From beginning to end, an extremely enjoyable rental experience. You would be hard-pressed to find a better unit on the property. 2104 is the place we called home for five nights and we couldn't have been happier. Clean, very well equipped, and near enough to the adult pool that we used it every afternoon after playing tourist all day. Mahalo, Debra, for your personalized attention. This condo is amazing. This is our second time to this unit and it is perfect inside and out. Great views of the Ocean!! The room is very well furnished and has everything you would need for a great trip (beach chairs, coolers, etc....). The only complaint that I would comment on is this unit has removed the AC unit since our first visit. I know most Hawaiian locations don't have AC at restaurants, etc....but it made it very difficult to sleep or shower after a long day. The unit remains very warm even with the windows open. If you are used to sleeping in a room below 75 deg, this is not a unit for you. I would strongly suggest to management to re-install the AC unit from before. But even with that complaint, we had a very enjoyable stay. We celebrated my husband's 60th birthday at Kanaloa, and had a terrific 2 week stay. The condo was beautiful and fully stocked, the only thing we had to buy was food. The location is scenic and serene, with the view and sound of the waves to soothe you. We will definitely return! My wife and I spent a week in Condo 2104 to celebrate our 25th anniversary, in January 2016. The apartment had everything we expected. The apartment was perfectly clean, the kitchen was fully equipped, there were plenty of towels, a washer and dryer and the pool area and grounds were beautifully maintained. Our favorite past time at the condo was sitting on the lanai and watching the surf. We ate all of our meals out there. We saw whales every day and schools of dolphins a couple of times. They were too far our for my point and shoot camera, but we could definitely watch them frolic with the kayakers and paddle boarders. We usually slept with the lanai doors open and could hear the waves from the bedroom. We did SCUBA dives four of our days and snorkeled with the mantas one night. This was a great base of operations. We learned to head south in the morning and north in the evening to avoid the Kona "rush hour" and it made for easy trips to the shore diving sites that we chose. Kanaloa is only 10 minutes from Keauhou Bay, where boats went out for the evening manta trips . I'm hoping we can go back soon! This was our 3rd time staying in this condo. We still love it every time. It is decorated with an Island Flair that enhances the experience. Well kept and clean, with a comfortable bed and a superbly stocked kitchen. The condo has 2 lanais but we usually used the main one that faces the ocean, Beautiful view of spectacular sunsets. The condo is quiet as is the resort, just a wonderful place to relax. The resort is also very nice with 3 pools and one is an adult only if you prefer a quieter time. Shopping is close by with good restaurants within easy driving distance. The condo is about 20 minutes outside Kailua-Kona for more shopping and restaurants. Thank you Debra for everything we will be back! this is not our first trip to kanaloa....this condo met our expectations to the fullest....relaxing,secure,and beautiful sunsets right on the lanai...add friendly staff when help is needed....gorgeous landscaping.....the sounds of birds and waves....outdoor bbq or in house kitchen for tempting dishes....all this makes for a great experience. We spent two magical weeks at Kona Bliss (December 17 through December 31). Breakfast on the lanai every morning to the rhythm of the waves crashing on the rocks. Cocktails in the evening in the same place as the sun set over the horizon. The condo was clean, modern and well stocked with supplies. We enjoyed the comfort of the space very much. Downtown Kona is a short 5 minute drive or, in our case, a great running route for swimming at the pier. There is a really great shopping center-(an easy walk) at the top of the hill which had everything we needed. We have stayed many places in Kailua-Kona over the years and this is by far our favorite. We will be back next year. While this condo is set just back from the ocean, it felt ocean front and it exceeded our expectations. Of all the places we've stayed in Hawaii, this one was stocked with care. Extra pillows are fluffy and comfortable, the linens are clean and crisp, the condo is tidy and has everything you need including a great array of beach supplies. They thought of everything! The view from the lanai is so wonderful, and even though there are condos around you, you never notice. The grounds are very quiet clean and well-kept. The pool and hot tub is spectacular. We visited a friend's condo closer to downtown Kona, nearly double the price, and ours was twice as nice. There is no air conditioning in this unit, however the condo has patio doors on both ends of the unit and is fully stocked with fans and we were able to keep comfortable. Last, the proximity to downtown for the Iron Man race was not a problem. We were easily able to get to and from downtown for the race and found parking easily. The distance should not be a deterrent and, in fact, was actually quite nice to be in such a quiet beautiful setting. I would definitely recommend this unit to anyone looking for a very relaxing stay while in Kona and I am still shocked at the quality and comfort for the price we paid. Nice and everything was good, but with the warmer weather missed the AC. My wife and I were blessed with this unit. The location; proximity to pools and shore, was a real joy. We spent 4 nights in the unit and found the accomodations to be wonderfully equipped. Anything you could possibly need were available. We had the unfortunate timing to be in Kona during one of the hottest and most humid periods of the year. The option of having air conditioning would have been a wonderful alternative to suffering in the heat. We would be careful to check for an air conditioned unit the next time we go to Kona or visit during the cooler time of the year because we really didn't sleep very well in the heat. Condo 2104 wa wonderful everything was clean and exactly as it was represented to be. The only problem we had was the first night. If the lock box number had been printed larger and been in the beginning of the road directions we would have been more readily able to see it. Everything in the end turned out well. Thank you and yes we would return again to enjoy your. Beautiful condo. Our second time in this condo. The condo is spacious, very well appointed with a definite island flair. We cooked most of of meals and the kitchen is well stocked with everything you could need. We loved the front lanai and spent most of our condo time out there. It overlooks the lava rock shoreline with crashing waves, whales most days can be spotted, and we loved watching the outriggers go out in the morning. The sunsets were lovely. The condo was very attractive, well decorated and fully stocked with all the necessities. It was in pristine condition. The view from the deck was lovely and while there is no air conditioning, leaving the doors open at night made it very comfortable. Fans were available but not necessary while we were there. It was very convenient having two bathrooms. The area pool by the ocean was great but quite busy at sunset. Arrive early for the best chairs. Having the shopping center nearby was very convenient. We loved everything about this condo! Well equipped with everything you need for a relaxing stay! The balcony ocean front view is amazing! You also have a great ocean view from the living room.fabulous jacuzzi tub in the master bedroom was a nice touch! A/c in the bedroom was worth paying for, as it got hot and humid in July. When we arrived we couldnt figure out how to useit, but a phone call to the property manager got us an answer quickly.The set up is fantastic everything easy to find and convenient. Location is fabulous, stores nearby and even our snorkel cruise departed about a few miles away! The pools were lovely, the adult pool nice and quiet, and ocean pool had a lovely view and for the kids too. Parking was great with your own designated spot! Downsides? Only a few. The guard gate at the front is rarely occupied which I found odd, and the staff was pretty rude to us maybe because we booked elsewhere through aloha condos, great choice btw! Expect to be an early riser because the curtains in the bedroom are very thin and it gets bright pretty early and the Hawaiian birds start their noisy calls around 515 am. But that is common in Hawaii every where we stay! This place is great and I hope to return soon! We were looking for a relaxing destination to rent for our first trip to the Big Island. Unit 2104 in Kanaloa at Kona, didn't disappoint. The unit was spacious and comfortable and felt very much like being at home. It was equipped with everything needed for a great vacation. Fully equiped Kitchen, laundry, beach toys etc. It was clean and exactly what we were looking for. The complex was extremely well maintained and the staff were constantly working and cleaning. The only downfall to the complex was that the ocean front pool was closed part of the time for repairs and we had the unfortunate timing of sidewalk repairs/grinding and maintenance right outside our unit for a large majority of the time so that was kind of noisy and intrusive... otherwise, no issues. We found the location central to groceries, restaurants, activities, shopping but quiet enough to be away from the tourist area. The unit is spacious and clean. Furnishings are comfortable and kitchen is well stocked. Views from the living room balcony are lovely and soothing. It can get a little warm in the afternoons, but just open all the windows and turn on the fans and it is fine. We didn't need the air conditioning during our stay but you might if staying in the summer months. Location is nice -away from town but only a few miles to restaurants, shops and beaches. Only complaint was that we could hear the upstairs guests stomping around. Not sure if it was due to an unusually heavy footed guest or just the nature of the building. It is well kept with updates. Lots of ammenities. Great location. Enjoyed the views. If we had any concerns they were addressed. I felt like it was truly at home for the 12 nights we stayed there. It was out of Kona a ways, but was perfect for us, because it was quieter. The condo was exactly as advertised - ocean front, well equipped, comfortable bed. Debra the manager was easy to work with. We stayed 10 nights - they did not supply housekeeping but we could have it for an extra cost. We did it ourselves. The condo was everything we expected. Nice ocean view. Very clean and exceptionally we well stocked, especially the kitchen. Wonderful for a couple wanting a relaxing getaway condo. The condo is well appointed, very comfortable and updated. The view from the lanai is wonderful and being in the middle floor condo, up one flight of stairs, was not an issue for noise. Kanaloa is a quiet getaway but close enough to Kona for activities if desired. I highly recommend this condo for a couple. My wife and I have stayed in this condo the last two years. We enjoy the location and the great view. The condo is wonderful, clean, comfortable and well equipped. We particularly enjoyed the lanai where we took most of our meals when eating in. The complex is well maintained and is located a bit out of town in a quiet area. We definitely would recommend this unit. It met all of our expectations and we hope to return in the near future. This was a lovely ocean front condo that was exceptionally clean and had all the amenities we needed for our stay. There were plenty of beach towels, beach chairs, and a boogie board. There were fans throughout to keep the air moving when it was warm as we do not like air conditioning. The king sized bed was really comfortable, better than most we have slept on. We enjoyed long mornings on the lanai and preparing meals in the well stocked kitchen. The complex is so well kept and we felt at home during our stay. Service was good. Location was great. Had all the amenities you could ask for. Air conditioning in the bedroom did not work for the first 3 days, so that made it uncomfortable to sleep which leads me to my next issue. The window coverings in the bedroom seemed real transparent and did not cover the slider or the window completely, which lead to a non private feeling. Like I said about the a/C, since that did not work we had to keep window coverings open during the night and just had an Uneasey feeling. Loved the condo otherwise, but unless window coverings were upgraded, Propbably would not rent this condo again. A perfect place to relax and enjoy the kona coast. The unit is spotless and extremely well equipped. Anything that could be needed is available for use. The kitchen is the best stocked vacation condo that I have ever stayed in and truly allowed for meal preparation. The extra touches of toiletries in the beautiful bathrooms made it seem as those I was staying at a luxury hotel. The pool areas were very beautiful but closed quite early so use was limited. I would be extremely happy to stay here again. Beautiful view and wonderful complex. We loved this condo. A family of 4 stayed a week. It exceeded our expectations. The only thing we wish is that it included a firmer mattress and pillows, as we have bad backs / necks. Absolutely gorgeous area. From the moment we arrived everything was perfect. The condo was beautiful the view was spectacular, completely first class all the way. Debra was a joy to work with she could not have been any nicer or more accomodating. I wish I could think of one negative thing to say but my husband and I cannot come up with one complaint. If you are looking for comfortable place for your vacation this condo is just for you. Spacy, neat and tidy. I could see how the owner cares about it. You can find anything you need for your perfect stay. Even more! Rooms are big, kitchen is nice and practical, bathrooms are excellent. I could see the owner has a very good taste and put an interest in details that make a whole image. There are two lanai, one of them ocean front. This one is quite large. There is lanai kitchenette and hiding place in which you can find body-boards, sun loungers etc. Close to this condo there are several swimming pools, tennis courts. Shooping mall is near. I do recommend this condo! This is a beautiful ocean view unit located in a great complex containing three swimming pools and a tennis court. The unit has been updated recently and is fully equipped. My wife and I had a great vacation and would return to this unit in a heartbeat. This was our first time here and it met or exceeded our expectations. It was easy to find and get into. It was clean and comfortable and well equipted with beach chairs, umbrellas, towels, a cooler and oter stuff that would be hard to bring from the mainland. The grounds were beautiful and well maintained although they started maintinence early so if you want to sleep in you might be dissapointed...which brings us to why four stars instead of five. This is a middle unit so you have people below and above you. The people above us had little kids and they were very considerate but we could still hear little feet running over our heads in the early morning. The other small complaint we had was with the pool. Some "young adults" were there one afternoon and took it over by not only being loud but running and jumping, evening diving into the pool. Although we saw security there several times at that time they wern't around. We would stay in this complex again...just maybe a different unit. Everything in the condo was as good or better than we expected. The location was great with a world class view of the ocean. We will definitely be returning to this location. The condo was gorgeous, immaculate. Beautiful view with waves crashing. Comms with Debra were great. Lots of thoughtful little touches. Everything went like clockwork. Would not hesitate to stay again. Absolutely recommended. The condo exceeded our expectations. We really enjoyed the pool by the ocean and sitting on the lanais looking at the ocean. The location was good and not too far away from anything we wanted to do or go to. Perfect spot to relax and enjoy the view,. Thank you for sharing your little bit of paradise with us for two wonderful weeks. Everything came up to our expectations. The condo was equipped with all the amenities to make our stay so restful and enjoyable. Our favorite part of the day was having breakfest on the lanai to plan our day. We found good restaurants and many fun places to explore. It was also nice to relax by the pool overlooking the water. We will be back!! My stay at Kanaloa was absolutely lovely! Great ocean view and beautiful garden, very comfortable condo - I really recommend it! We had very good time at your property. It was very confortable, very well equipped, clean with unforgatabel view. We are looking forward to visite Kona again. Our stay in Condo was very pleasant and comfortable. Condo's furniture is very tasteful and practical. There are a lot of facilities you need when you are on vacation, esp. on distant island. And ocean view - absolutely magical. I will never forget this view. The best thing is bathrooms - very clean and tasteful. You can see the Owner has a Good taste. Everything you can find In Condo is very nice and practical. We have been to Hawaii many times and have rented numerous condominiums at different properties. This was our second time to rent Unit 2104 at Kanaloa at Kona and the fifth time to stay at Kanaloa at Kona. The property is always expertly maintained and conveniently located for our exploring and snorkeling along the Kona coast. The Unit 2104 is extremely confortable and is well supplied with all essentials to move in and start enjoying our trip to paradise. We did not have to waste a minute of precious vacation time shopping for the the basic supplies needed to prepare meals. Spices, sugar, coffee, gourmet seasonings were all there. Sitting on the Lanai with our morning coffee or an evening refreshment, watching the pounding surf is an excellent way to unwind from the pressures of life. We are counting the days until we can return to Condo 2104. It feels like a second home to us. 5 th. stay a Kanaloa at Kona and this was one of the best condo yet. Well equipped and good location. We had a very nice stay here for 10 days and found the unit to have everything we needed. It was clean, neat and nicely appointed. Directions were good, and accessing the unit was easy. The view from the deck and proximity of crashing waves are awesome!! And the (3) pools and hot tubs were nicely maintained and enjoyable to use. The surrounding tropical grounds made me know I was in Hawaii, despite the barren, volcanic landscape along the highway getting there! The location is good and central for visiting all the different communities and climates on the island (and the volcano) and I would recommend it to anyone wanting a condominium accommodation. However, if most of your activities (like golf) are centralized along the northwest coast line, being north of the airport would reduce the daily trips up the highway. The owner was super to work with supplying information and helping with reservations. The condo exceeded our expectations. Everything one could ever want was available in the condo. It was so comfortable and clean, spacious. The grounds were very well kept, bbq located within close walk, pool. Office great. Close to KTA market and Longs. Just loved it!!!!!!! We rented the Kona Bliss condo at Kanaloa at Kona from March 7-14, 2012. 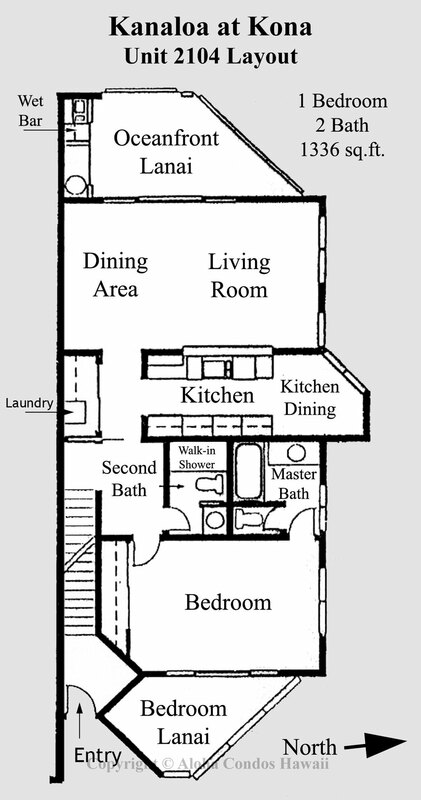 It is a one bedroom and two bath unit. This is the fourth time we have rented at Kanaloa but the first time we have rented this unit. The condo is very nicely furnished and complete with new appliances including a front load washer/dryer. It was very clean. Very clean, nice location, parking very close, nice view -- all and all very nice experience. Ac worked in the bedroom -- not in the living room. But you get enough breeze from the ocean. We had a great time here, the condo was great, very well equipped kitchen! View from the lanai was very good also. The oceanside pool is just splendid, I could have spent the entire vacation there. The condo is close enough to a couple restaurants and grocery store that you can easily walk if you choose. Market up the hill by KTa on saturday's was awesome also. Beautiful condo in beautiful location! This updated condo with beautiful views of the water was a delight to stay in. It is well maintained with everything you could possibly need to make your stay relaxing and comfortable. The owners deliver on everything promised and more! Your oondo was absolutely beautiful and had everything that we needed. We have never stayed at such a clean and tidy place. The amenities were endless; you thought of everything. We had breakfast every morning on the lanai overlooking the ocean...what a beautiful way to start our day. This was week one of our two week honeymoon and we wish we would have spent the full two weeks with you. The resort was great as well; very quiet with beautiful pools. Thanks for making our honeymoon so special. We will definitely come back to you when we visit the Big Island again!! My husband and I stayed in unit 2104 at the Kanaloa at Kona for 2 weeks. We wish we could have stayed a lot longer. The condo was wonderful, clean, comfortable, tastefully decorated with an island flair, and superbly stocked. The lanai (deck) off the living area faced the rocky ocean front and was wonderful to eat, relax, read or just visit on. The resort was beautiful and we loved the location a little out of town, and quiet. We definitly would like to come again. Very nice condo, well furnished, great water front location. Many upgrades, with nice personal touches. Yes, upstairs people are noisy whom ever it is. Not to be helped. No problems, we loved it here. Beautiful codo!Well positioned and completely functional.Very well kept and clean.Big thumbs up! Love the unit..our 2nd time there. Views are great and sun sets are awesome in December. Well stocked unit. Wish were still there as having torrental rains in SoCal! Will stay there again.Only issue is noise from upstairs in # 2106...for first 4 days there were 6 adults upstairs, very talkative foreigners, scraping deck chairs constantly, and up at 5 am stomping the floors. We called Kema and front desk to report. After 2-day respite, 2 young couples moved in and while we expected the worse, were surprising okay on noise. We love Kanaloa complex after many years saying there. Conot 2104 is an outstanding unit. Wonderful experience watching the ocean waves hit the rocks . Enjoyed the condo so much we did not go out as much as we first intended. The tile work in the entry, kitchen, and bathrooms of the condo is expectional. This unit is very well maintained and and contains everything you need for a great vacation. I would reccomend it to anyone who wanted to stay in the Kona area. Very beautiful grounds and three beautiful swimming pools that we really enjoyed. Would definitely stay here again when we return to the Big Island!! If you can use a one bedroom unit with a couch that becomes a bed, this is a great unit to stay in. Especially enjoyed the Lani offf the living room! when I pay a lot of money, I do expect a little bit of luxury. This is a lovely condo, the location isn't bad, the washer and dryer are a nice convenience, the bed is comfortable, but honestly speaking, it could use a bit of up dating. The noise from above was really annoying. Every footstep is audible, and there were many footsteps. The sliding door to the ocean facing lanai sticks and is difficult to open .We have friends who stayed at another condo complex for quite a bit less money and their units were much more up to date and much classier, and considerably less money - also, larger. This unit is nice enough, but it is not the luxury unit I thought I was getting. A.motorcycle group came in for a few days during our stay, and while I realize they were not trying to be loud, the noise from their bikes was quite obnoxious while they came in and out and worked on repairing and tuning their bikes. All in all, bottom line, I was disappointed and felt like I overspent on our accomodations. Thank you for your feedback and I’m truly sorry your stay at my condo was disappointing; we strive to provide our guests with a pleasant and memorable experience in paradise. I do not think the presentation of the condo on the website is misleading - Alohacondos.com goes to great lengths to accurately portray our units with numerous photos of every room from every possible angle, so I am quite puzzled as to what you were expecting as far as decor and size. I do understand your concern about the lanai doors, I am having them replaced but it is taking longer than I would have hoped. On the noise issues, a phone call to me, to the front desk, to security, or my property manager could have re-mediated the noise from upstairs. Motorcycles over the holiday weekends do happen and unfortunately I have no control over other guests staying at the complex. We loved the condo. It was clean, tastefully appointed, and the view and sound of the surf were marvelous. We had booked a snorkel trip to Kealakakua Bay and were delighted to find that the meeting place was just around the corner and down the street. We wanted to stay at Kanaloa at Kona because of a relative's wedding and other family members were staying there but renting from office. I didn't like the reviews I read about the renting from the office so I found this condo owned by a private owner. It was great to see the pictures before renting and everything was just as promised. It was a wonderful stay and if I have the opportunity to travel to Kona again, I would rent again. For our honeymoon, we wanted to stay on the water and figured that we would have to make huge sacrifices to be able to afford the location. The minute we walked into our Condo at Kanaloa at Kona, we knew we were going to have a great time. Everything was beyond our expectations from the outdoor seating on both ends (with one overlooking the ocean), to the first-class kitchen (fully stocked) and huge master bedroom with it's own private bath. What really made it special was the little touches like the flowers in the bathrooms, the Hawaiian and Classical music in the CD player and, of course, the beach gear outside. We had the most romantic, magical honeymoon during our stay here. 2104 has a excellent location with a outstanding view of waves crashing onto lava rock directly in front of the ocean side lanai.Very tastefully decorated, the best of all the condos we have ever rented. Everything you could possible need in cookware is provided in great quality.Highly recommended. Great two week stay. Wish this owner had rentals on other islands.The grounds and pools are in perfect condition. My wife and I had loved the condo. It was clean and the location was great. We could hear the ocean all night long. Quite surroundings except for hearing the birds sings. We had a wonderful time. The condo was all it was advertised to be, and very convenient, both to things we needed and from things we didn't want (eg Ali'i strip.) We found the 2 bagged chairs broken but still 'sand' usable. One umbrella was totally broken. We added 2 beach roll-ups and a small cooler to the outside storage. If/when we are able to return this is certainly where we would want to stay. Thanks. I do not know how we could have enjoyed our experience at Kanaloa any more than we did. hope to return for an encore soon. The condo has recently had some upgrading done, and it is very nice. It was clean and well equipped with almost everything we required. The location is great. The grounds at this complex are kept up beautifully.We would not hesitate to go back there again. This was our first trip to the Big Island. What an amazing place to stay. The condo had everything you could need and was VERY clean. The location was very convenient to everything - shopping, beaches, dining. The view from the condo was amazing!!!! The whole experience was a 10+ - we will return and stay here. Great view! Great condo! Great experience! We loved the condo. It was tastefully furnished and decorated. It was also very well equipped. Both bathrooms and kitchen were nicely renovated (except maybe for the cupboards which needed to be refreshed on the inside). Everything worked very well. When the BDR TV didn't, mamagement was quick to try to fix it and soon enough we got a brand new TV. The grounds are beautifully landscaped. The people around, staff and guests are friendly and relaxed. It was a little noisy at times: maintenance crew in the morning and people upstairs at night. However, there's a lot to do on BIG ISLAND and we went out often. We did have to drive to get to most places though. There is a supermarket, bank, post office and a few restaurants 5 minutes away. Overall, we loved our experience there and we highly recommend this condo. We hope we can come back someday. The Kona Bliss condo has everything you could want. It's got a perfect ocean front location that's got the world's best sunset views, is well appointed, has big rooms and generous lanai and has everything you'd ever need. The complex is well located and the pools and BBQs are great. The owner went above and beyond to make sure we had directions and instructions for our arrival. It's nearly perfect. So why not 5 stars? Noise. This is not a top floor condo and you hear just about every footfall upstairs. Admittedly we were there when probably the least considerate people on Earth were upstairs. There was a large group, including at least two kids who ran constantly all day. We were pretty sure the hall mirror would come off its hanger at some point. There was no way to enjoy the vacation holy grail - an afternoon nap. When more reasonable people came at the end of our stay, it was far better. Maybe it was bad luck for us, but you are at the mercy of your neighbors. Too bad, because we'd love to love this place but just can't. The Condo was beautiful,the view was gorgeous. It was a trip of a life time. We we're very pleased by everything. The weather was so great, we didn't have to use the A/C at all, but the fans were going most of the time. We didn't cook there other than the toaster and coffee pot, cause it was my vacation too and that met I didn't have to cook. Yeah!! It was most enjoyable, quiet and clean. The TV worked nicely and the stereo too. It was very well kept and stocked. Thank you for letting us use it. My wife and I visited the Big Island to celbrate our 40th Wedding anniversary. Our unit was spacious, up to date, clean and really worked well for us. It was nice having two bathrooms. We only used the ocean side lanai, even though there was on off of the bedroom, as well. We especially liked the pools, but, unfortunately, the restuarant at the main pool was closed - a victim of the economy. We were within a short distance to a shopping center, where we stocked up on provisions. Also, we visited the nearby Outrigger to eat have a Mai Tai in the Veranda (recommended) and the Country Club (we did not play golf, but there are two great golf courses there. We drove down Alii Drive and looked at all of the other places that we were considering and were so glad that we paid just a few dollars a night more the the condo at Konaloa. We would gladly return. The condo was spacious and had a nice view of the ocean from the lanai. We enjoyed listening to the waves crashing against the shore from the bedroom at night. It was nice to have the washer and dryer in the condo. The condo was close to restaurants, and there was also a grocery store nearby. Overall, a very nice place to stay. We would definitely stay there again! The service was excellent. Couldn't find a better location. The place was outstanding, but a little more that I needed. My husband and I just returned home from 11 days in this lovely condo. The condo was well stocked with all the beach essentials--towels, chairs, and umbrellas (my personal favorite!). The condo was as pictured. The view from the deck was fantastic--very beautiful. Also, we loved the shower. There were only a few downsides. Primarily, the walls of the condo are very thin and for most of our stay we had VERY noisy neighbors. It literally sounded like someone was running on a treadmill in the unit above ours almost every night between 1:00 a.m. and 3:00 a.m. It was almost unbelievable. Unfortunately, we slept through the night only 2 of the 11 nights in Kona. The only other point worth mentioning, we did find two cockroaches in the kitchen during our stay, even though we were diligent about taking out the trash. All in all it was a great condo, and if the neighbors were quiet, it would have been pretty close to perfect. As for location, we found that we preferred the north end of the island and most days drove the 35 minutes north to the nicer beaches in that area. I think our next visit we will stay up that way, were the skies are a little clearer and there is a breeze. Loved the island though, can't wait to go back. This condo is on our favorite area of the Big Island and is very well kept. The unit is very well equipped and comfortable: we found it exactly as advertised. We had an excellent experience and definitely recommend it. My wife and I celebrated our 25th Wedding Anniversary by spending 11 days in this condo. This was our first visit to the Big Island and the condo and island far exceeded our expectations. This condo is beautifully decorated and is in an excellent location. We really enjoyed constantly hearing waves crashing into the lava rocks just a few feet from our lanai. This unit is very close to a BBQ and the pool next to the ocean. A shopping center is only a few minutes away which has a supermarket and some excellent restaurants. The best snorkeling I have experienced is only a 5 minute drive and the center of Kona, where we have many excellent dinners, is only 15 minutes away. We highly recommend staying in this condo and will definetly be back. We stayed here for our honeymoon and were extremely impressed with the size of the place (2 bathrooms!) and the amenities. We didn't want for anything (there were even flashlights and rain gear). The air conditioners were top of the line and we loved the jacuzzi bathtub. The lanai overlooking the ocean was also wonderful. We loved it here and didn't want to leave! My son and I stayed in this condo and thoroughly enjoyed it! It has a great ocean view from the lanai and is very nicely decorated with all the amenities of home. The complex itself is very well kept and there is a fabolous ocean front restaurant close to the unit. I would highly recommend and will hopefully stay there again when visiting the Big Island. My fiance and I went to Hawaii for our wedding/honeymoon. When we arrived at the condo we were more than impressed with it. The grounds were just georgous, it was a tropical paradise. The condo was more than we expected, better! They supplied everything that you would need i.e. soap, shampoo, laundry detergent, etc. I do not have one negative thing to say about the condo that we stayed in. We will stay there again and would recommend it to everyone. It was a wonderful trip that we will never forget! !